Join us on Thursday 8 March at 8 p.m. in the Liquor Rooms, Wellington Quay, Dublin, for our celebration of International Working Women’s Day. 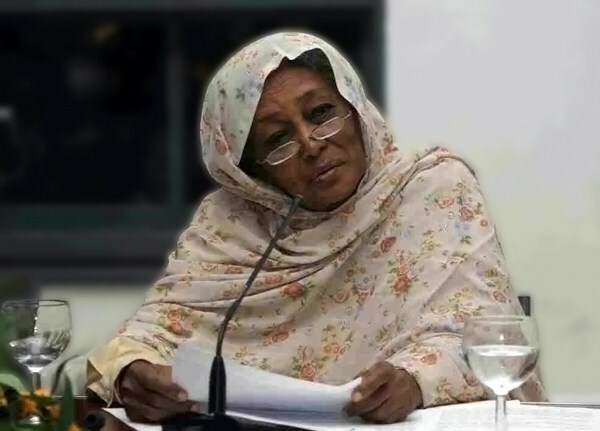 On 8 March, a day established to honour the accomplishments, the lives and the struggles of working women, we wish to mark the courage of women—women who in the past struggled fearlessly against difficult conditions in domestic and industrial labour and who in the present continue to struggle in an era of increasing hatred, division, and exploitation. In 2018 women are bravely facing these challenges. 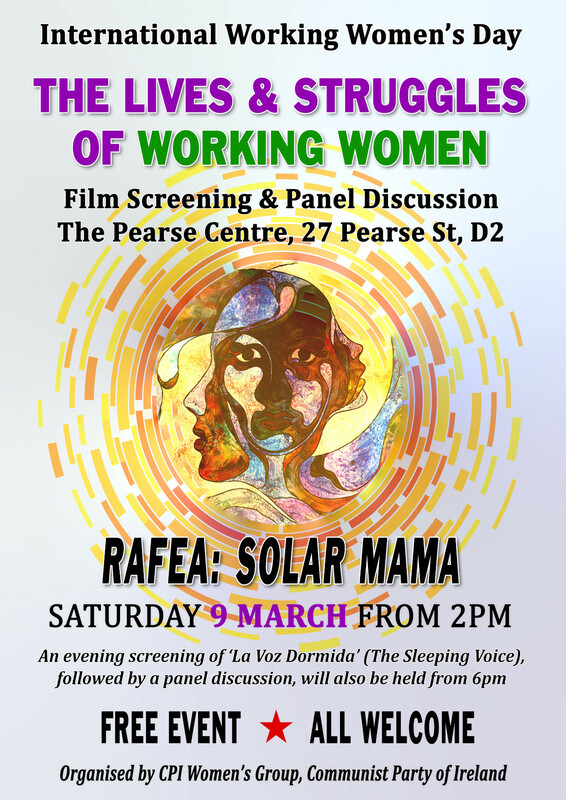 Our event wishes to showcase the endurance of contemporary socialist-feminist activism, and the continued relevance of International Working Women’s Day. 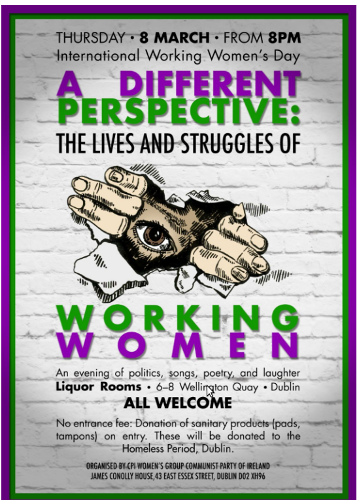 Our event, “A Different Perspective: The Lives and Struggles of Working Women,” will shed light on the activists who are leading the charge in resisting sexist-capitalist exploitation and oppression within our community, both in Ireland and internationally. Our host of speakers will lead a discussion focused on working conditions, abortion access, housing, imperialism, and neo-colonialism. Through this discussion we will illuminate the vitality of the socialist-feminist struggle in 2018. 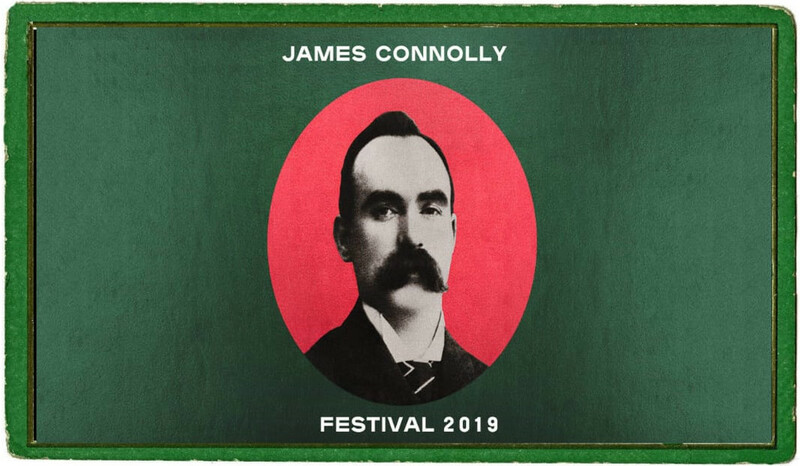 A range of artists, musicians and poets will provide entertainment on the night. Join us in the celebration of revolutionary women, past and present! We are asking for a donation of sanitary products (pads, tampons) on entry. These will be donated to the Homeless Period, Dublin, which shares these products with front-line services for distributing to women in need.